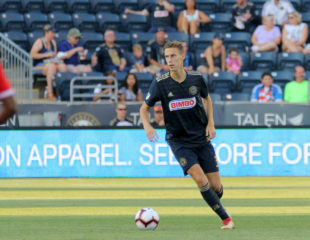 The Union won on the road, thanks to a Jack Elliott brace and a PK from Fafà Picault. Local, Boston, and national coverage. The first of Jack Elliott’s goals has been nominated for MLS Goal of the Week. After the game the Special Olympics Philadelphia unified team faced off against Massachusetts’ Special Olympics unified team. Massachusetts won, but Jim Curtin still hung around to congratulate the Philly team. Meanwhile, in Ghana they’re using David Accam as clickbait to get west Africans to care about the US Open Cup. Penn FC lost to MLS-bound/USL eastern conference leaders Cincinnati FC. The other intra-state rivalry continued this weekend with the Pittsburgh Riverhounds beating Bethlehem Steel FC 2-1. PSP match report for that Riverhounds-Steel game here. With a second half goal from Jukka Raitala, the Impact managed to secure a tie in Salt Lake City, keeping the race for the East’s final playoff spots extremely tight. Whitecaps Coach Carl Robinson takes a position on Portland’s most important debate. Sporting KC are a bunch of homewreckers. Toronto thinks they’re still in the game. However Jozy wasn’t in most of the game. I may have been to quick to dismiss Wayne Rooney for being too old and too Shrek to make a difference in this league. So, Ruidiaz is Neymaring a bit here, but what is with is Zeigler’s thousand-hand slap? We’re not in the promised land yet, but at least some people think we’re on our way there. Janine Beckie to Manchester City. Actually, that transfer to Manchester changes some of the math for that big draft day mega-trade earlier this year. As Sky Blue FC still struggles to provide adequate facilities for it’s players, the Washington Spirit is investing in their youth academy. Tangentially related, the Australian women are coming to ESPN+ along with the men. Honestly, Coutinho should be honored to be put on the same level as Mallory Pugh. Oh good, just what he needed. Though at least it’s not an ACL. Jozy’s feeling pretty good about the young guns coming for his spot. It’s not the most extraordinary goal, but Tim Weah played off the bench for PSG and scored the third goal in their 3-0 shutout of Caen. Still in pre-season, Pulisic started the push that put Dortmund ahead of Lazio early. In a still-developing story, Geoff Cameron appears to be leaving Stoke to join Josh Sargent and Aron Jóhannsson at Werder Bremen. With a 2-2 draw against Spain, the U20 USWNT has been eliminated from the U20 World Cup in the group stage. This isn’t disgusting at all. For some reason it appears Cristiano Ronaldo is surprised Juve is being nice to him. The U20 Women’s World Cup is underway currently in France. If you’re up early this week it’s a great way to see the future of women’s soccer. And crazy improbable stuff like this. And of course the return of the Premier League means it’s time to arm yourself with responses for the unavoidably awful hot takes. Well all I can say this week is… at least we’re not Orlando City. Amusing idea that Accam was at the heart of the Union win in the Open Cup last week…especially since he was SUBBED WHEN IT WAS STILL 0-0!!! That whole sequence by Rooney is just amazing. Mad props to him.